My name is Dawn McLeod Heim, author of the book “Step-by-Step Guide to Painting Realistic Watercolors “. As I walked around the room to see how they were doing, I noticed that some students were having difficulty gauging the amount of pigment to use when mixing their colors, while others had trouble seeing and understanding values, and the students who were new to watercolor were lost because they hadn’t yet learned the basics. There were even a few students admit they didn’t know how to draw. Once my beginning students had learned the basics, I was then able to incorporate them into my regular ongoing classes. I knew they still needed guidance and with a class size of 14 students all learning at different levels, I needed to figure out a method of teaching that would accommodate them all. After several weeks of jotting down notes, my interpretation of a “Class Project” was born. The goal of my “Class Project” was to provide my students with as many visual aides and tools possible to make their learning process not only smooth and easy, but also successful. The following is a list of colors, brushes, and paper that I used and recommend for achieving equivalent results to that of the finished rose. Transfer this line drawing onto your watercolor paper, enlarging or reducing it as needed. When you are finished with Step 1, your duckling will look like this. Mix colors [ 1 ], [ 2 ]. With your kneaded eraser, remove enough graphite from the duckling to make the lines barely visible. Load your brush with [ 1 ] and paint the beak, carefully painting around the areas that need to remain white, and softening the one inside edge with a clean moist brush, as shown in the illustration. Rinse your brush and blot well. Duckling headLoad your brush with [ 2 ] and, starting at the beak, paint upwards along the eye line, and as far as the illustration shows you to. Take a separate brush loaded with water, blot lightly, and soften upwards to the top of the head. Let that area dry completely. Paint the small area to the left of the beak in the same manner, keeping the eye area a very pale value. Let dry completely. Rinse your brush and blot well. 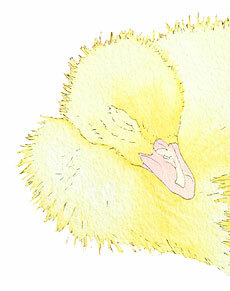 Duckling bodyLoad your brush with [ 2 ] and paint along the top of the chest stopping at the top of the beak. Quickly take a separate brush loaded with water, blot lightly, then charge the water from your brush into [ 2 ]. Paint with this combination until you reach the wispy feathers at the end of the chest. 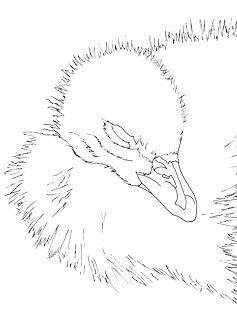 With [ 2 ] still in your brush, quickly paint the large area surrounding the beak as far as shown in the illustration, allowing the left edge to gently charge into the water. Quickly take a separate brush loaded with water, blot lightly, and gently charge the water into [ 2 ]. Paint with this combination to the ends of the wispy feathers on the wing. Let dry completely. Rinse your brush and blot well. Take your brush that has a fine point, load it with [ 2 ], and paint all the wispy feathers surrounding the duckling (a small section at a time), softening the lower edge with a clean moist brush. Let dry completely. When you are finished with Step 2, your duckling will look like this. Mix colors [ 1 ], [ 2 ], [ 4 ]. Load your brush with [ 1 ], and using the beak illustration as a guide, paint only those areas as shown, softening some of the inside edges with a clean moist brush. Let each area dry completely before painting the one next to it. Rinse your brush and blot well. Let dry. Duckling headLoad your brush with [ 4 ] and, starting at the beak, paint upwards and along the top of the eye line as shown in the illustration. Quickly rinse your brush and blot well. Load your brush with [ 2 ], and charge [ 2 ] into [ 4 ]. Paint only a short distance with this combination. Rinse your brush and blot well. Take a separate clean moist brush, and soften upwards as far as shown in the illustration. Let dry completely. Paint the eye area next. Load your brush with [ 4 ], blot once, and carefully paint along the top and around the white shape as shown in the illustration. Quickly rinse your brush and blot well. Load your brush with [ 2 ] and gently charge [ 2 ] into [ 4 ]. Paint a short distance, switch back to [ 4 ]and finish at the neckline. Quickly take a separate clean moist brush and soften all the inside edges. Rinse your brush and blot well. Let dry completely. Duckling bodyPaint the chest area first. Load your brush with [ 4 ], and paint a short distance across and down the chest. Quickly take a separate brush loaded with [ 2 ], and charge into the lower edge of [ 4 ]. Paint down the chest a short distance, then soften with water. Repeat this across the rest of the chest and down the wing. Charge [ 2 ]into the wing, and soften to the ends with water. Continue to paint upwards, causing [ 2 ] to charge in with [ 4 ]. Soften with water. Load your brush that has a nice point with [ 4 ], and paint all the wispy ends of the fluffy feathers along the top of the head, the chest, and along the back, as previously done in Step 1. 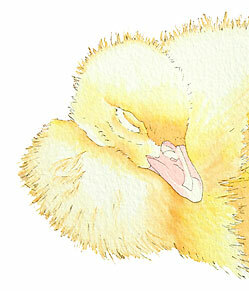 When you are finished with Step 3, your duckling will look like this. Mix colors [ 1 ], [ 2 ], [ 3 ], [ 4 ], [ 5 ], [ 6 ]. Load your brush with [ 1 ], and paint the light pink areas, softening some of the edges with a clean moist brush as shown in the illustration. Let each area dry completely before painting the one next to it. Rinse your brush and blot well. Let dry. Load your brush that has a nice point with [ 3 ]. Quickly paint all along the top of the beak. Keep the lower edge moist. Blot your brush well. Quickly load your brush with [ 5 ], and gently charge into [ 3 ], then soften the edge with a clean moist brush. Let dry completely. Rinse your brush and blot well. Load your brush that has a nice point with [ 5 ], and paint the nostril hole. Let dry. Duckling headLoad your brush with [ 6 ]and, starting at the beak, paint upwards and along the top of the eye line as far as shown in the illustration. Soften the edge upwards with clean water. Let dry completely. Rinse your brush and blot well. Load your brush with [ 4 ], and paint the area that separates the head from the chest. Rinse your brush and blot well. Load your brush with [ 6 ] and charge into [ 4 ]. Soften upwards a short distance with a clean, moist brush. Let dry. Load your brush that has a nice point with [ 3 ], blot, and paint the narrow area under the eye line, using very tiny brush strokes. Duckling bodyLoad your brush with [ 4 ]. Paint across the top of the chest to the beak, and as far down as shown in the illustration, softening the edge with water. Rinse your brush and blot well. Let dry. Paint the area directly under the beak next. Load your brush with [ 3 ], and paint the small dark area as shown in the illustration. Do not rinse out your brush, but blot it well. Quickly load your brush with [ 4 ], and gently charge into the surrounding edges of [ 3 ]. Paint with this combination as far as shown in the illustration. Rinse your brush and blot well. Load your brush with [ 6 ], and charge into the left and right side of [ 4 ]. Paint as far as shown in the illustration, softening the edges with water. Load your brush with [ 6 ], and paint the area to the upper right of the beak, softening with water. Rinse your brush and blot well. Let dry completely. Paint the wispy feathers. Load your brush that has a nice point with [ 4 ], and blot. Dip the tip of your brush into [ 2 ] and, using wispy brush strokes, paint the individual feathers on the head, the chest, and the areas shown on the back. Let. dry. 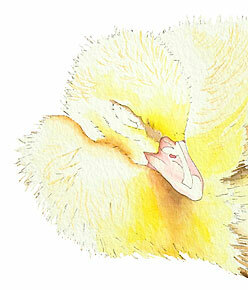 Take a separate clean, moist brush and randomly soften across the feathers you just painted. Let dry completely. When painting the wispy feathers, try to keep the lines as narrow as possible, and stroke your brush upwards and away – not downward toward yourself – using a quick motion. Try not to make them straight. If you find they are wider than you would like them to be, try blotting your brush once to remove some of the color, and/or try using a lighter pressure with your brush. yes the steps are very easy.. she is a great painting teacher. Wow, these are really great instructions. I can’t wait to try this. Well, I am a frustrated artist trying everything to get a little more skill in drawing and painting. I was very pleased to find this site.I wanted to thank you for this great read!! I love water colours. Easy steps but look so beautiful! LOVE your book. I have had it for years and highly recommend it to all my watercolor students. It has helped me with my explanations and method of teaching. Thank you very much.